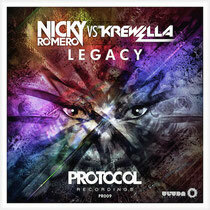 Nicky Romero has just released ‘Legacy’, his collaboration with Krewella, on iTunes. Since its initial release, Nicky Romero has seen the single become a popular track, reaching #1 on Beatport along the way. Described as an unmistakable hybridisation of big-room flair and bass-driven intensity, the track highlights what can happen when two big names in dance music come together. Nicky continues to push his creativity to the limit churning out crowd favourites like his most recent collaboration with Sunnery James & Ryan Marciano, ‘Sound Of The Underground’ featuring Fast Eddie. ‘Legacy’ flows through an evocative sequence with the familiar Krewella vocals layered over playful, filtered synths and evolving percussive elements that lead into a frenzied build. The track then ignites with the full-throttle energy of booming drums, dynamic melodies, and a powerful, wobbly bassline. Check it out below.